Now is the time to build your own airplane simulator cockpit. Flight simulation software has never been better, and I can help you upgrade from using just a keyboard and mouse. My online tutorials teach you how to use common materials from a hardware store to build an airplane simulator cockpit (simpit) or a functional framework for your flight controls. The time to realize your dream of flight is now! Strap into your new DIY Flight Sim and take off! Ambitious, audacious, hard-core simpits! Sure these projects are large, but my videos and instruction manuals show you how to build these projects one step at a time. Are you using Hands On Throttle And Stick (HOTAS) flight controllers or do you use a Virtual Reality (VR) headset? These DIY projects will help tremendously to keep your controls secure while you fly. These are DIY Flight Sim projects built by my customers. 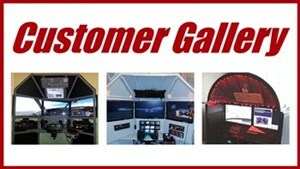 See the awesome flight sims my customers built! Learn all the basic skills for building or modifying a DIY Flight Sim project. Dozens of free how-to videos and articles. 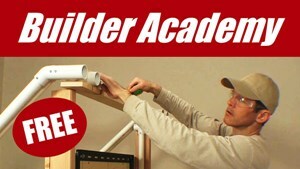 Enroll in a DIY online course. View on any device - even a smartphone! Why Choose DIY Flight Sims ? Check out the Customer Galleries and let the projects speak for themselves. Here is CUSTOMER GALLERY 1 and also CUSTOMER GALLERY 2. My step-by-step instructions give people the confidence to build a DIY simpit project even if they have limited building experience. Many builders modify and add features to their project to match their resources and needs. You get more than just some CAD drawings. You will see what it's like to build these projects in the real world with video and pictures from and actual project. The videos and manuals are detailed and expertly produced by Matt Thomas, an FAA Certified Flight Instructor. It's amazing that inexpensive PVC pipe, lumber, and paint can make a bunch of separate peripherals into an attractive and functional home cockpit. Think about how much you spend on a computer, monitors, controls, software, etc. For a small fraction of that amount, you can buy some building materials from a home improvement store and build a DIY Flight Sim.